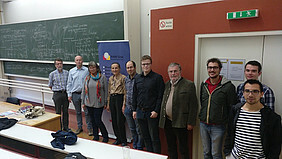 Prof. Swanson (4th from left) with some attendees (faculty members and students from the University of Graz and TU Graz). In her inaugural talk, Fulbright NAWI Graz Professor Irena Swanson gave an overview on the development of her research theme of homological algebra in the last century, explained long-open conjectures as well as recent breakthroughs. Students and faculty members of both universities attended this session on Oct. 4th. In addition to an inaugural, Irena Swanson's talk also served as the first class of her lecture "Homological Algebra" in winter semester 2018. Beyond teaching, Prof. Swanson's four-month-term as a Fulbright NAWI Graz Professor also focuses on research. We expect fruitful scientific exchanges arising from combining the complementary expertise of Prof. Swanson's and the respective Graz mathematicians, namely professors Karin Baur, Sophie Frisch, and Alfred Geroldinger. NAWI Graz is very proud to host Irena Swanson, a world expert and leader in several aspects of commutative algebra, especially dealing with computational commutative algebra and the theory of integral closures. We expect her stay to be highly beneficial for NAWI Graz students and researchers alike.